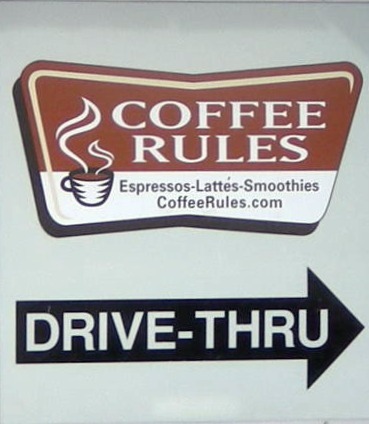 2/22/2012 UPDATE: Coffee Rules has closed. Just look for this place. 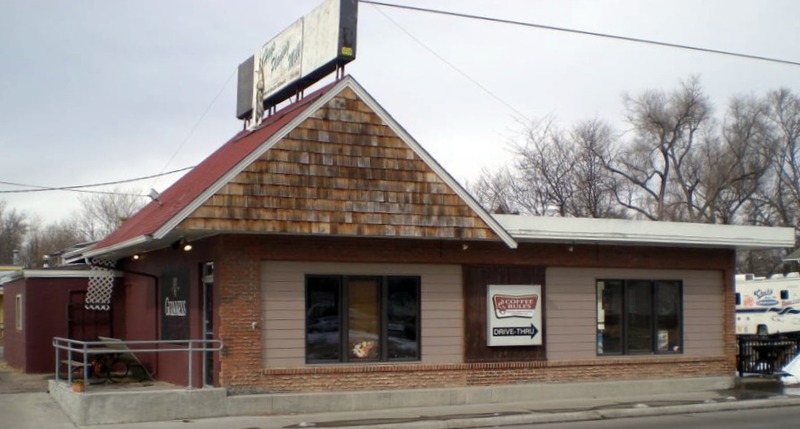 After a late season pheasant hunting trip, fellow blogger Mike and I decided to try and find a good western Kansas BBQ restaurant. We found a coffee house instead. I know what you are probably thinking, (“a coffee house, have you gone crazy?”) But this wasn’t just any ol’ coffee house. This place ruled…just like the name says: Coffee Rules. Located near the campus of Ft. Hays State University, Coffee Rules is no ordinary coffee house. Sure, you can get all the lattes and espressos you want…just like at any other coffee house, but you can also get wine, premium beers, and barbeque. That’s right, this place sells barbecue. Terry’s Backyard Barbeque, to be exact. It’s got food like this. 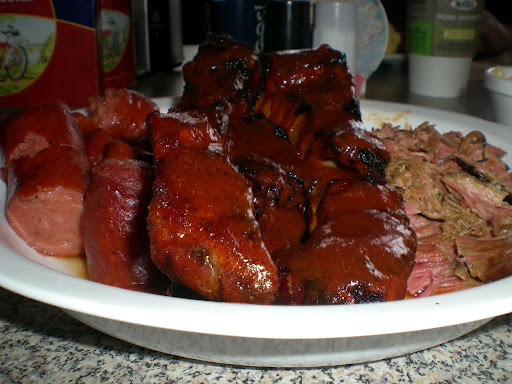 This stuff may not be exactly like your traditional Kansas City style barbeque but then again, Terry doesn’t claim that it is. In fact, the sign on the bright blue smoker claims that Terry serves his food “German Brewed and Barbequed.” German style barbeque is common in areas east of Austin, Texas where the Texan’s of German ancestry have specialized in sausage, rather than ribs. And really cool things like this. Note: Mike is completely overwhelmed with joy. In my opinion, Terry Kinderknecht has got great barbequed sausage right here in Kansas, which I find to be somewhat of a rarity in most traditional Kansas City Style barbecue establishments. My hot links tasted kind of like a smoked polish sausage….only better. I would certain recommend a visit to Coffee Rules for some cowboy coffee or some German brew and barbeque! As for the giveaway this week? 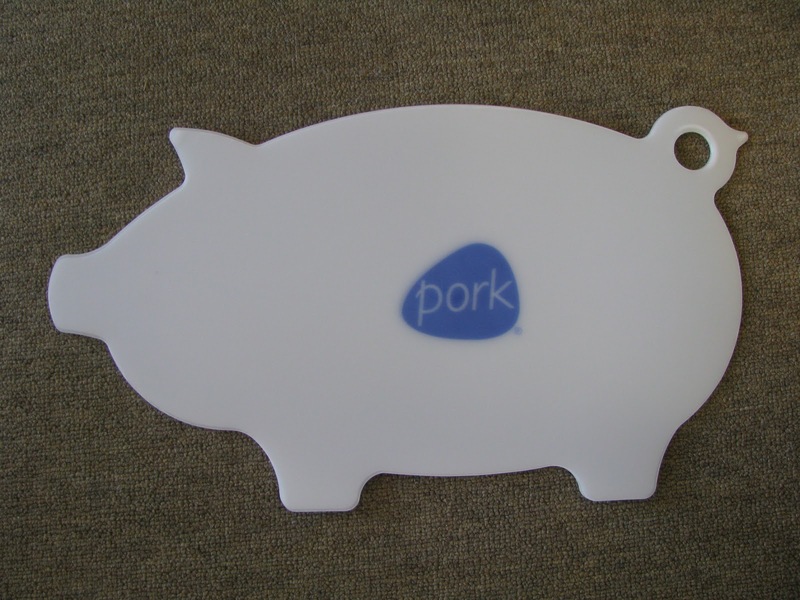 Answer this question by Friday, February the 25th at 10 a.m. to win this pork cutting board! Question: What is your favorite soup that includes pork? Lately I’ve written a lot about barbecue, so I thought it was a good time to change things up and try some pork at one of the local Mexican restaurants. 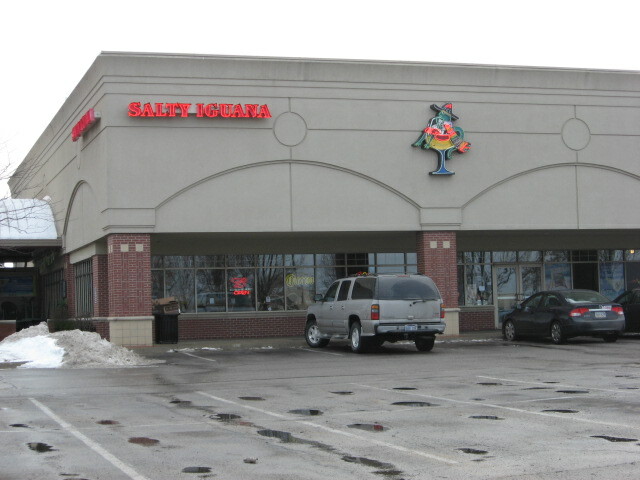 I decided to go to “Salty Iguana” in Overland Park (just west of U.S. Hwy. 69 and 135th St.) on my search for a great Mexican pork dish. I’ve eaten at Salty Iguana several times, and have always thought it was as good, or better, than any Tex-Mex food you’ll get in the Kansas City area, but I’d never paid close attention to all the pork possibilities they had! Since shredded pork is a big part of traditional Mexican cooking, I wasn’t shocked when I saw many good choices of ways to eat pork at Salty Iguana. If you look at the menu, you’ll see several variations of chili verde with pork being served up. Some of the options you’ll find are Mexican Chili, Tacos Pueblo, Traditional Carnitas, Chili Verde Plate, and a chili verde stuffed chimichanga. 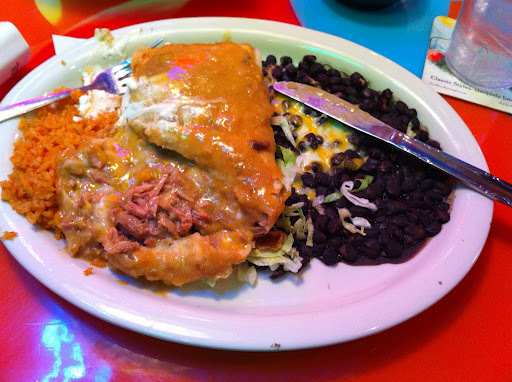 On this trip I chose to go with the chimichanga stuffed with green chili pork, which was an excellent choice. The Chimichanga was perfectly cooked, and the pork filling was absolutely delicious. The slow-cooked pork practically melted it was so tender, and the amounts of green chili sauce and pork hunks were in perfect balance inside the crispy chimichanga. Like most Tex-Mex eateries, the prices are reasonable, and the service is fast and friendly at Salty Iguana. As an added bonus, you can entertain yourself looking at all the bizarre iguana art on the inside walls! As a K-State graduate, I feel like I should warn you of the fact that Salty Iguana is a close partner with the Jayhawks! While it can be hard for someone that bleeds purple to set foot in such a place, I have to tell you the many ways to eat pork here make it worth it. It’s sure good enough to keep this Wildcat coming back anyway! This week’s giveaway is is for those of you who love pork as much as we do and don’t mind admitting it. This apron is 100% cotton with Teflon finish for added protection. It has 2 waist level patch pockets with 1 pen pocket, 1″ wide neck and waist ties, and adjustable neck strap. Answer this question for a chance to win. How much iron does a 3 oz serving of pork contain?